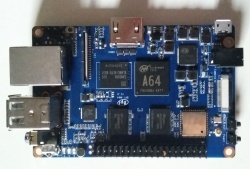 Banana Pi M64 Ultra is a A64 based development board produced by Sinovoip. Despite its name, the M64 is incompatible to previous Banana Pi boards (Banana Pi/M1/M1+/Pro/M2/M2+/M3), due to a different SoC - requiring different boot loaders and drivers. It's another attempt to cash in on the Banana Pi's popularity with a SBC only sharing brand, name, form factor and GPIO header. O header. alongside with the BananaPi (Bpi) logo. From the software point of view this device is similar to the Pine64 (similar DRAM, same Ethernet and PMIC), so basic support should work with some Pine64 image. In fact the manufacturer seems to offer Pine64 images based on longsleep's builds. Use the bananapi_m64_defconfig build target. Use the sun50i-a64-bananapi-m64.dtb device-tree binary. The Banana Pi M64 has the usual 40-pin, 0.1" Raspberry Pi 2 compatible connector with several low-speed interfaces. Pin PC1, which carries the SPI0-MISO signal, is not available on a header, since it is connected to the eMMC chip. So booting from a SPI flash connected to header pins will not work on the Banana Pi M64. The FEL button (called U-Boot key in the manual) triggers FEL mode. The boot order is: SD card first, then eMMC, then FEL. Pressing the FEL button always triggers FEL mode. A SD card without an eGON header will be skipped, it continues on eMMC then. If boot0 fails to locate U-Boot, it will enter FEL mode. The two type A receptacles are connected to a Terminus Technology Inc. 4-Port hub on the lower PCB side that is connected to the SoC. 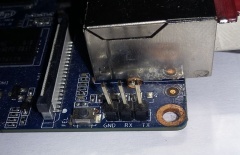 PCB traces on the board provide a 3rd USB port connected to the hub on solder wholes next to the 40 pin GPIO header (polarity 'information'). There is a three pin UART header next to the Ethernet socket, it is connected to UART0. The pins are clearly labelled with GND, RX and TX. Attach a 3.3V UART interface as described in the UART howto. From a software point of view there is not much difference from the Pine64, which is the main development vehicle for the A64 SoC support. So please check the Pine64 page for further information. This page was last modified on 4 December 2018, at 06:49.